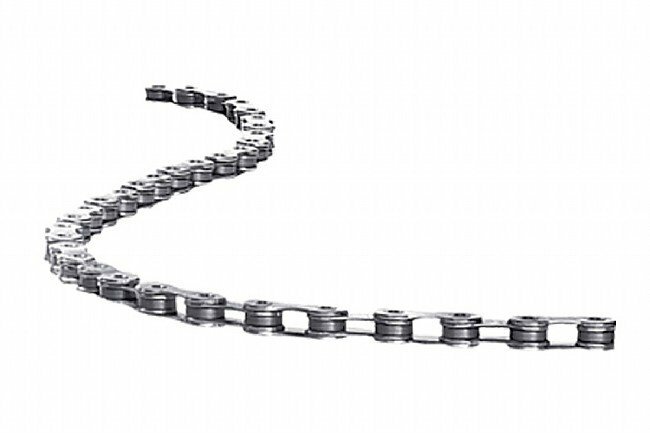 With the introduction of 11-speed to their new Red group, it came time for SRAM to redesign their top chain. The Red-22 model has been made slightly narrower to accommodate the 11-speed cog spacing yet manages to maintain excellent durability thanks to a new inner plate finish and chrome hardened pin construction. More heavily chamfered outer places reduce noise and ensure reliable shifting performance, and HollowPin™ technology keeps weight to a minimum. The Red 22 chain is compatible with SRAM and Shimano 11-speed systems. 242 grams, 114 links. Includes the PowerLock™ silver connector/masterlink. Pre-lubed with PowerLube™: high performance lubricant. I have used 6 of these chains on a SRAM RED HRD Drivetrain. Love the master link and easy installation never a stiff link. Chain runs and shifts great. I get about 1000 miles out of each chain. I weigh 177lbs and climb 10,000 to 12,500 weekly. I typically deep clean (citrus degreaser with a chain cleaner tool) 3 times per life of the chain. Less expensive than Dura Ace but just as solid dependable. A tad smoother quieter. Just what I had expected on my new S-Works Tarmac with SRAM Etap shifting, but pricey. I like the quick fastener, but Shimano has switched to them also. Anyway, I went back to Ultegra (for the much lower price) and noticed no difference in performance. Great shifting and longevity. Works great with my red22 components. Don't know about longevity yet. It keeps my bike moving forward. Without it, I need a hill (downward). The chain is light and makes my SRAM Red R22 drivetrain swift faster and quieter.